Arkady Rylov is a famous landscape painter and symbolist, a student of Stieglitz and Arkhip Kuinji. In many ways, these teachers and predetermined his work. The painting “Sunset” was written in the revolutionary year 1917. To some extent, it is also a symbolism – the decline of the old world. 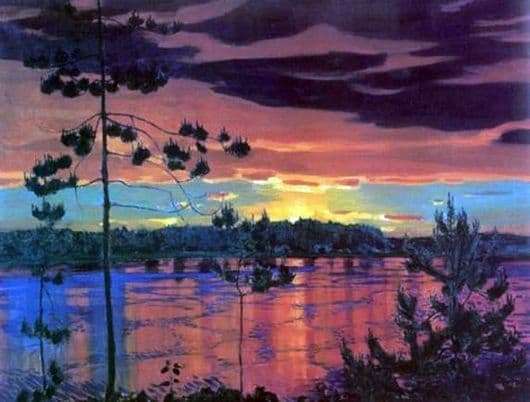 In Soviet times, when Arkady Rylov was called the founder and head of the Soviet landscape school, “Sunset” was considered an absolutely symbolic landscape. From this point of view, red tones mean “fire of revolution”. Such an interpretation of the canvas is quite possible to allow. Rylov supported the revolution, later became an active supporter of the new government and one of the founders of Soviet art. Many see certain life-affirming motifs in the “Sunset” canvas. In the picture – a traditional northern landscape. Twilight, slightly stretched, in the north. River, along the shores of which high larches and pines grew, the setting sun. Several unconventional colors of the picture. For the most part it is black and red, or rather, crimson. Upon closer inspection, the viewer realizes that in fact the sky is turquoise, the water is blue, and the rest of the range is the result of the fact that the setting sun illuminates the last rays of clouds and clouds. Against the background of crimson-red clouds – ink clouds and numerous conifers. Peering more closely, you can discern that the picture shows spring, new branches grow on trees with soft needles. The viewer looks at the river as if from a high bank. The sun leaves behind the trees that grow on the other side of the river, lower. From here – a fascinating view. The picture is not among the most famous. On it you can appreciate the whole range of colors, which the artist used in his work. The canvas is stored in Smolensk, in the Museum of Art.